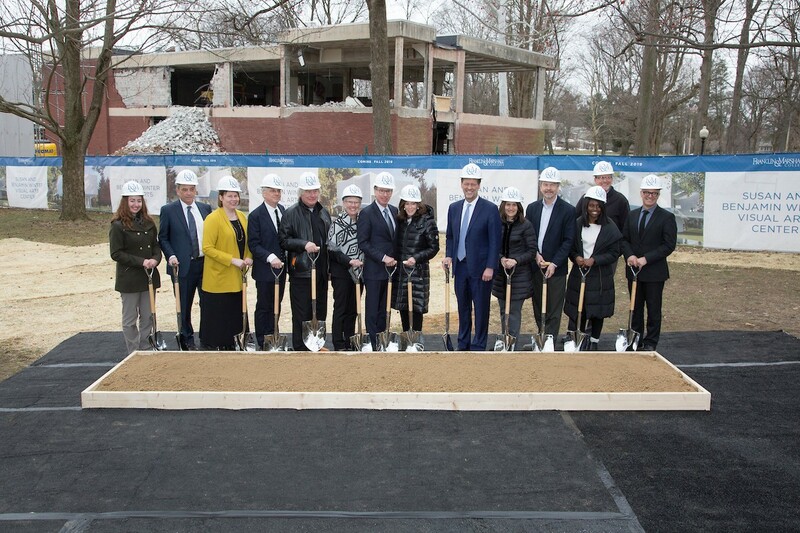 Franklin & Marshall College and Steven Holl Architects celebrated the groundbreaking for the new Susan & Benjamin Winter Visual Arts Center. The new Winter Visual Arts Center will facilitate the creation of art and the study of visual culture in spaces designed to foster creativity. The Center will include a wide range of teaching studios, galleries managed by the Phillips Museum of Art, classrooms, student and faculty work spaces, space for digital and analog film production and editing, and an 84-seat cinema that doubles as lecture hall and performance space. The site’s remarkable surrounding trees provided a central idea for the composition of the building, which Steven Holl calls a 'pavilion on the park'. Raised kite-like into the trees, the building’s light profile is a concave response to the large diameters of the campus’ trees—many over one-hundred years old and the oldest things on F&M’s historic 19th century campus. A prominent feature of the design is a glass-enclosed forum in the center of the ground floor that will allow pedestrians on the campus side of the building to see through to the green landscape of Buchanan Park. The new building will form part of a new Visual Arts Quad with a storm water reflecting pool at the south end of the campus marking a new college entry centered around the arts. The billowing suspended lightweight architecture of the new building is articulated with thin in wall trusses – like a box kite. The concrete walls at the ground level articulate the light and heavy distinction like the heavy trunks of the nearby trees. Transsolars influence on design: The skin is made of a new recycled glass aggregate material called 'Poraver' with natural light to all studios provided by insulated channel glass and skylights. There are operable glass windows in every studio. The state of the art geothermal heating and cooling of the new building, and its super-insulated envelope are part of the aspirations of a sample future architecture of near 'net zero' energy. A large reflecting pool doubles as campus stormwater overflow. The reflections of the hovering building at night glowing in the water add to the special articulation of this place defining the new Arts Quad. The Center will open in Fall 2019.